The Leukoplast Leukopor Fixation Tape for Sensitive Skin (2.5cm x 5m Roll) uses low allergy adhesive suited to highly sensitive skin. Designed to prioritise comfort, the water repellent fixation tape provides long lasting protection for cuts and wounds in conjunction with bandages and dressings. The Leukoplast Leukopor Fixation Tape for Sensitive Skin uses low allergy adhesive; ideal for those with sensitive skin. With comfort the priority, the Leukoplast Leukopor Fixation Tape offers safe and unobtrusive wound protection for young children and those who suffer from allergies. 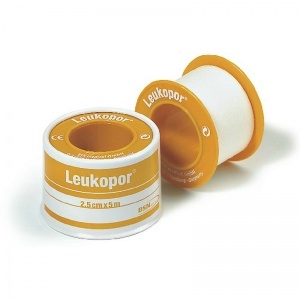 The 2.5cm x 5m roll of Leukoplast Leukopor Fixation Tape offers adaptability and extensive use. Easily cut to the desired length, each role of the Leukopor Tape for Sensitive Skin offers gentle protection for numerous wounds, injuries, cuts and abrasions. The Leukoplast Leukopor Fixation Tape for Sensitive Skin (2.5cm x 5m Roll) is usually dispatched via First Class Royal Mail and delivery should be within 1 to 3 working days.